I Don’t Want a Bigger Moto X. I Want a Better Moto X. Last year's Moto X is the best phone I've ever owned. It's just the right size, it has just the right features. And by the time I'm ready to upgrade, it won't exist anymore, because the way we make smartphones now is dumb. Overnight, Motorola announced its successor to the original Moto X, which while also being called the Moto X is not, in fact, the Moto X I currently own and unabashedly love. Don't get me wrong; it's by all accounts a great device. But while this Moto X inherits the spirit of its predecessor—along with its indispensable software tricks—it is and always will be an imposter. Why? Because it's bigger. Much, much bigger. Someone gave my Moto X a Super Mario mushroom, and there's no Koopa Troopa army big enough to shrink it back down. Why do we do this to our devices? Why do we change them so drastically year to year? Motorola's not the only one, and it's not only about size. The HTC One was the first beautiful Android phone; the HTC One M8 is bigger and far less stylish. The Galaxy S4 was a noble (albeit plasticky) flagship; the Galaxy S5 looks like a flattened-out golf ball. Forget leaving well enough alone. Most phone manufacturers won't even let pretty great be. And last year's Moto X is pretty damn great, in a way that this year's build can't be. The jump from 4.7 inches to 5.2 inches might not sound major, but it's the difference between comfortably navigating the entire display with one hand and having to stretch your thumbs or double-fist it. It's the difference between disappearing in your pocket and being a bulge. Most of all, it's just an inexplicable rethink of what was a near-perfect build. It's as though Toyota suddenly decided the 2015 Camry should be an SUV. What's most frustrating is that the reasons for the gargantuanization aren't technological. That better camera, those better speakers, those faster guts all would have fit snugly in last year's design. The reasons Moto gave us for the switch were "market research"—hopefully not from the same source that gave us these ads—and the desire to fit two IR sensors on the front, so that you can wave at your phone to make it shut up. Given the choice between perfect phone and disposable gimmick, I choose perfection. Or would, anyway, if I could. The kicker is the revelation that the Moto X body I currently own isn't just destined for fossilization; its brains have also been dead-ended. 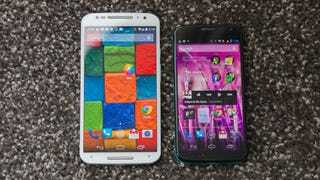 Like the new software tricks in the new Moto X? Enjoy them from afar, because they won't trickle down. It's a dead-end device, as far as Moto's concerned. And once its battery dies, or I drop it at the wrong angle, it'll be gone forever. The only arguable exception to this fickle phone fabrication is Apple, whose iPhone, now in its eighth year, has only seen one truly significant design overhaul, when it transitioned from the 3GS to the iPhone 4. There have been other tweaks and twiddles along the way—it gained screen size and ditched the double glass sides between the 4S and 5, but without dramatically altering the dimensions—but the most common complaint leveled against Apple's smartphone design progression is that it's so boring. Which is just a rude way of saying that iPhones are consistent and recognizable. If you like this year's iPhone, you'll almost certainly like next year's, because it will look largely the same, if not identical. That's how you build a fan base. That's how you create a juggernaut. By this point, you have decided that I am an insane person. You're probably right! It's just a phone. But what bothers me most is that Motorola thinks of it that way too. A phone like this deserves more than a year to build its audience. A wonderfully perfect thing deserves to stay that way. I understand the compulsion to throw sizes at a wall to see what sticks. I understand trying a larger version on for size. But calling this hulk a Moto X isn't fair. I know the Moto X. It's the best phone I've ever owned, and I'm going to miss it when it's gone.